The actual images at the right were made by simply exposing the screen to light - and then turning it upside down... that's it! 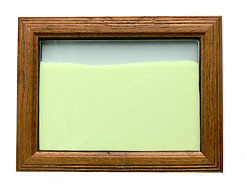 Each time you expose it to light and turn it over, it produces a new, 3-dimensional mountain landscape scene. Here's something guaranteed to keep you busy in the dark for hours! 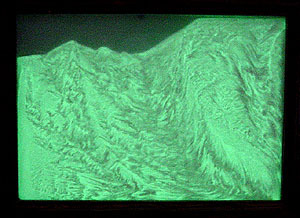 3D Landscapes® contains a special grade of our Europium UltraGlow® Phosphorescent Powder, and sealed between two 5 x 7 sheets of glass. Simply exposed the screen to light for a few seconds, then turn it over to allow the powder to mix, and you'll be amazed at what you see! 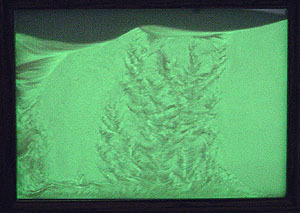 When the screen is exposed to light, the tiny particles of Phosphorescent Powder that were up front (against the glass sheet) "charge up" and begin to glow bright green. When the screen is turned upside down, the glowing particles mix with the particles that were shaded (deeper inside and didn't get exposed to light). As the light & dark powders mix, it produces varying "flows" of light and dark material that create amazing 3 dimensional images of mountainous terrain... no two images are ever the same! Simply expose to light again and flip over to create another unique image! Etch a Sketch®. Use the 3D Landscapes® screen over & over - there's nothing to wear out and it is constructed with all non- toxic materials. No matter how old you are, 3D Landscapes® is a blast. 3D Landscapes® Drawing Screens are all individually handmade by our craftsman. United States & foreign patents pending. Copyright © 2019 United Nuclear Scientific LLC.